The following are the accessories from HAI that may be used with our Omni family of products. Products from our Connectivity Partners will also work with ours. Model 32A00-1 OmniTouch Touchscreen NEW!!! Model 14A00-8 Water Temperature Sensor NEW!!! Model 31A00-1 Indoor/Outdoor Temperature Sensor NEW!!! Model 31A00-2 Indoor/Outdoor Temperature and Humidity Sensor NEW!!! 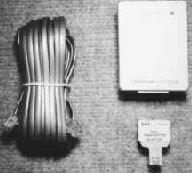 Model 21A05-2 Serial Cable NEW!!! Advanced Lighting Control (ALC) Switches and Interface Module NEW!!! Omni Family Universal Mounting Plates for Structured Wiring Enclosures NEW!!! The 33A00-1 console has an updated look with larger buttons, a new “cool blue” backlight, and a thinner profile. Each features a 48 character backlit LCD display with menu operation, backlit keys, selectable keyclick, beeper functions and viewing angle. A two-color LED offers status at a glance: red for security armed, green when disarmed. 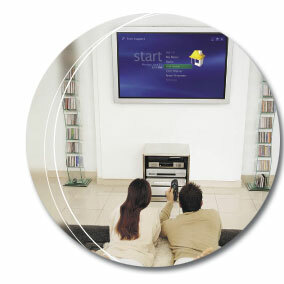 All control, security and programming functions can be accomplished using a console. It has Silk Screen with the menu options printed on the console face. The 33A00-3 Flush Mount kit provides a painted backbox that mounts in the wall; the console then mounts into the backbox providing a professional, built-in look. This colorful "plug and play" touchscreen interface for Omni-family controllers facilitates graphical control of security, HVAC, lighting and other home control functions via easy-to-recognize icons. The unit features a 3.9 inch color, touch sensitive LCD screen with backlighting that adjusts automatically to ambient lighting conditions and turns off when not in use. The two-color LED offers status at a glance, and there are selectable keyclick and beeper functions. The touchscreen unit mounts flush with the wall, and is supplied with a white, beige, and almond faceplate that is a slim 3/8 inch for an elegant built-in look. OmniTouch works with OmniLT, Omni II, and OmniPro II. It connects to 4-wire console bus on the controller. The PESM (Programmable Energy Saver Module) is used to override existing thermostats for set-back control. It can also be used for sensing and controlling other temperatures, such as attic fans, garage fans, greenhouses, basements, wine coolers, humidors, etc. 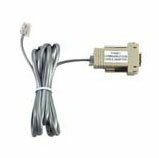 Can also be used to control spa heaters with remote temperature sensor. The PESM reports temperatures to the controller, and has a low voltage relay and LED indicator for control. The PESM doubles as a freeze sensor, which can cause the controller to dial out in the event of a furnace failure. The 14A00-8 is a temperature sensor used to monitor the temperature of pools, spas, aquatic ponds, and greenhouses. The temperature sensing device is potted in a stainless steel probe. It is designed specifically to monitor water temperature from the return/source and then report that information back to an HAI Omni Family controller. Supplied with stainless steel mounting screws and waterproof connectors. The Model 31A00-1 and Model 31A00-2 Indoor/Outdoor Temperature Sensor is used for sensing outdoor or indoor temperature. It is coated with a sealant to withstand outdoor moisture and features a new, high accuracy temperature sensor that doesn’t need calibration. The temperature can be used to activate programs for controlling temperatures in attics, garages, greenhouses, basements, wine cellars, and coolers. The temperature can be displayed on the console or spoken over the telephone. It can also report, log, alert, or generate an alarm if the temperature reaches freeze conditions or if the temperature goes above the high setpoint or drops below the low setpoint programmed in the system. The Model 31A00-2 also includes a Humidity Sensor that is used for reporting the outdoor or indoor relative humidity from 0 to 100 percent. High and low humidity limits can be set for taking action (i.e. turning on the bathroom vent fan, running a/c in de-humidification mode, turning on humidifier in heating mode, etc.) or reporting high or low humidity conditions in homes, greenhouses, wine cellars, coolers, humidors, etc. Controlling humidity is particularly helpful in combating the growth of mold in vulnerable areas of the home, such as bathrooms, basements, attics, etc. Model 21A05-2 Serial Cable - NEW!!! This cable connects the built in serial port of an OmniLT, Omni II or OmniPro II controller to personal computers for HAI Web-Link II, HAI Windows PC Access, and other systems DB-9F connector. This module expands the OmniLT by adding 16 zones and 8 voltage outputs with overload protection and reset. The module comes with mounting hardware and cable to attach to the OmniLT controller. The 16 zones can be programmed for burglary, temperature or auxiliary inputs. 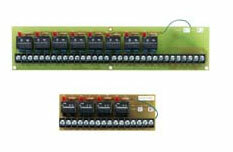 The 8 outputs have individual overload protection, with overload indicator and reset button. The Model 17A00 Expansion Enclosure adds sixteen voltage outputs for control and sixteen inputs for additional security/fire zones, auxiliary or temperature inputs. The 17A00 can be mounted up to 1000 feet from the main controller and has it's own power supply and battery. It is commonly used for sprinkler systems, control of pumps, motors, remote control circuit breakers, and additional security/fire zones. 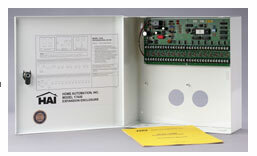 Up to four Expansion Enclosures can be used in conjunction with the HAI OmniPro or OmniPro II controller. Optional Model 19A00 8-Relay Module and Model 10A07 4-Relay Module mount in the enclosure. The Model 18A00-1 Omni Demo System is a comprehensive package which includes the HAI Omni Controller, RC-80 Programmable Thermostat, Omni Surface Mount LCD Console, Demo Board Adapter Kit, TW-523 and Tough Tone Speakerphone. Packaged in an attractive robust case, the Omni Demo System allows HAI dealers to actively demonstrate all automation and control features in the HAI product line. Kit comes fully assembled and programmed with factory defaults. 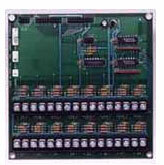 This module adds 16 fully configurable input zones to an Omni, Omni II, OmniPro, and OmniPro II systems. The module comes with mounting hardware and cable to attach to the controller. Terminals are provided for 16 additional zones that can be programmed for burglary, fire, temperature or auxiliary inputs. 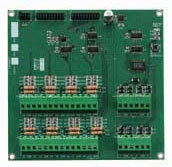 Up to 2 modules can be installed on the Omni II and OmniPro II for an additional 32 zone inputs. 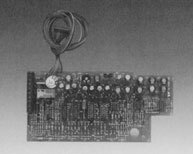 The Model 18A00-5 Demo Board Adapter Kit is a pre-wired circuit board that plugs into the terminal sockets on all HAI controller products. 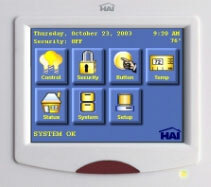 It is used in HAI Demo Systems and is now available to dealers for showroom displays, model homes, and other product demonstration applications. Features include quick connect to console, thermostat, telephone, PC and 24 VAC transformer plus phone line simulator, modular jacks for phone and console connections, built in temperature sensor simulator, and two switched zones for security demonstration. The Model 10A11 Two-Way Audio/Voice Alarm Module allows two-way communication with a central station after an alarm, paging and listening from an on-premises or remote phone, annunciation of alarm and zone by voice, and voice messaging*. The Model 10A11 can be used with OmniLT, Omni, Omni II, OmniPro and OmniPro II automation controllers. After an audible alarm, the module allows the central station to control the listen/talk mode. After a silent alarm, the module allows listen in only. 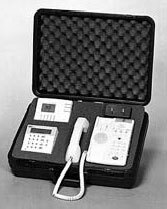 The Model 28A00-1 and -2 is a speaker and microphone assembly that allows two-way communication with a central station after an alarm, paging and listening from an on-premises or remote phone, annunciation of alarm and zone by voice, and voice messaging*, when connected to a Two-Way Voice Module. It may be used outdoors in weather protected areas. Four or eight separate relays convert HAI voltage outputs to Form C relay contacts. Contacts rated 5 amps at 24 VDC. LED indicators show which relays are energized. 10A07 is supplied with foam adhesive mounting tape; 19A00 has mounting holes.